The Robinson-Pavey home was featured in the Friday, Aug. 25, 1978 edition of the Record-Herald where author Dr. Allen D. Griffiths detailed the history of the house, dating back to the beginning of its construction in 1848. Current plans for the house include finishing the move to its final location at 1733 State Route 41 Southwest in Washington C.H. on July 9. 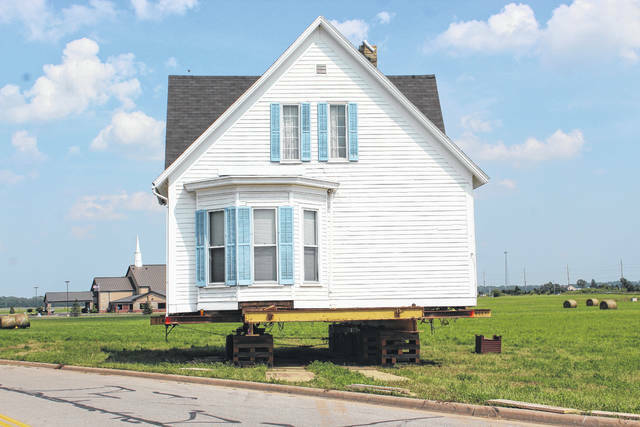 The historical home being moved down State Route 41 will be delayed further as crews wait for Independence Day celebrations to wrap up next week. Emma White — the local resident who commissioned the move — spoke on Tuesday about The Robinson-Pavey home, which remains on Halliday Way, saying the house will not finish its trip to 1733 State Route 41 Southwest in Washington C.H. for another two weeks. White said the move will once again begin early, probably around 6 a.m. She said even though they don’t have far to go, they have to keep the heat in mind and will be awaiting permission for DP&L to move power lines. North Folk Holdings took ownership March 6 of a 1.33-acre site at 403 W. Court St. that will be developed into the new Sonic drive-in restaurant, necessitating the move of the historical home. North Folk Holdings operates 35 Sonic drive-ins, primarily in Ohio, West Virginia, Kentucky and Missouri, said Jake Stauffer, a partner at North Folk Holdings, Inc., in a phone interview earlier this year with the Record-Herald. The Robinson-Pavey home was featured in the Friday, Aug. 25, 1978 edition of the Record-Herald where author Dr.Allen D. Griffiths detailed the history of the house, dating back to the beginning of its construction in 1848. The first owner, John H.Robinson, who was born in New York in 1821, continually built onto the “Gothic Revival” style home until 1860 and, Griffiths wrote in his article, that the home appeared to be the oldest Gothic Revival house in the county. Stay with the Record-Herald for more updates on the moving of the historical Robinson-Pavey home. https://www.recordherald.com/wp-content/uploads/sites/27/2018/06/web1_IMG_2718-1.jpgThe Robinson-Pavey home was featured in the Friday, Aug. 25, 1978 edition of the Record-Herald where author Dr. Allen D. Griffiths detailed the history of the house, dating back to the beginning of its construction in 1848. Current plans for the house include finishing the move to its final location at 1733 State Route 41 Southwest in Washington C.H. on July 9.